With its white rose-like flowers this truly is a stunning addition to any garden with its tolerance for low water and its ability to become a beautiful lacy screen. 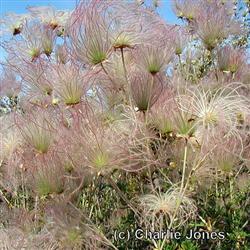 After flowering this plant produces feathery seed heads that give its name. Ranging from green to pink to reddish these plumes provide a dramatic sight when back lit. Cut back the seed heads in winter, and provide deep watering about once a month to keep this plant looking its best through the summer, if no watering is provided Apache Plume will lose its leaves in summer. An indigenous tribe steeped its leaves to create a hair tonic.